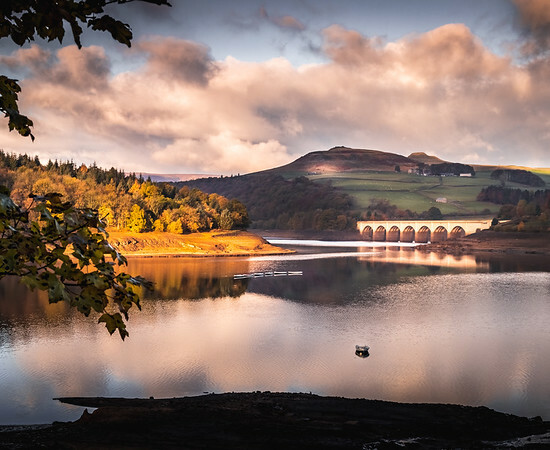 Ladybower Reservoir just after sunrise as seen from Bamford Edge. We were a little late and couldn't reach the top of Bamford Edge for sunrise mostly because we could find the trail to climb on time. Got a couple of shots near the start of the trail before beginning our ascend and reached the top a few minutes after the sun had risen. The view from the top was just breathtaking - well worth the early start and the freezing climb. 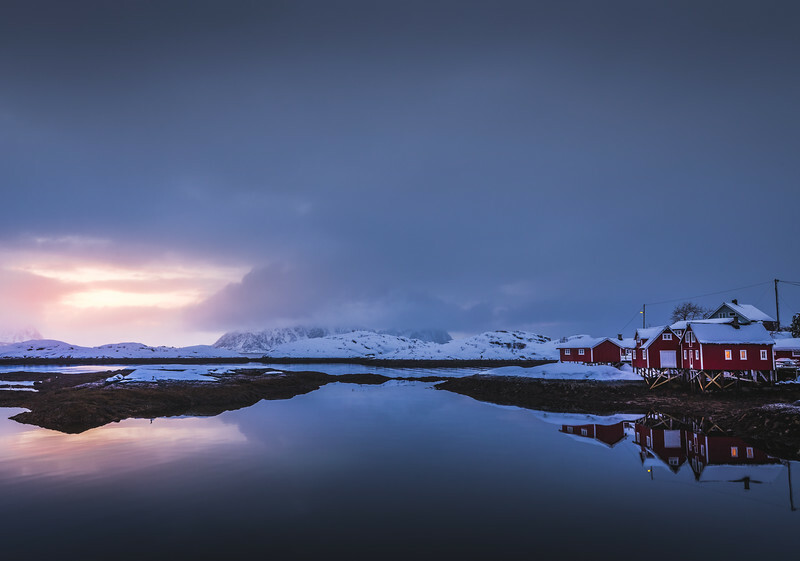 One of Nature's "Magic Light" moments. We were driving on this country road in the peak district and noticed that the elevation of the road offered some great views across the valley below. The weather was mostly overcast with these tiny holes opening up in the clouds for a few seconds now and then. From there it was just a game of patience and it took a good 15 - 20 minutes before the light hit the right spot and illuminated just these fall coloured orange and red trees - A perfect Nature's Spotlight! 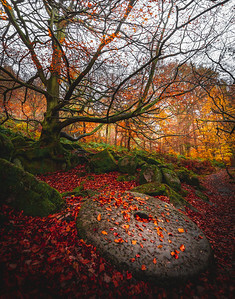 An abandoned mill stone at Padley Gorge server as a reminder of the history of this place. Peak District was host to a number of flour mills many of which are still in use. The old mill stone adds a sense of mystery and interest to this autumn forestscape and makes one wonder why and how did this get here while also providing an amazing foreground. Peveril Castle was closed for winter when we arrived so we couldn't enter the castle grounds. 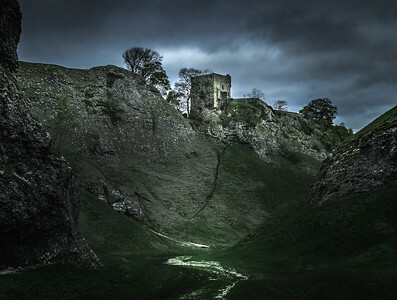 However we decided to hike the nearby Cave Dale valley, and we were glad we did as the hike offered some fantastic views of the Castle and the surrounding hills. The valley sides are almost perpendicular and over 50 metres in height. It was initially formed by glacial meltwater carving a deep narrow valley in the local soluble limestone. The river then found a route underground leaving a dry valley with caverns underneath. Later on the caverns below Cave Dale collapsed making the valley even deeper and gorge-like at the northern end. The difficulty in taking pictures in a forest is that, although everything looks stunningly beautiful to your eyes, more often than not, the picture looks like a complete chaos. It helps if you include a prominent subject as it gives the viewer something to focus on and makes the chaotic composition simpler. I was glad I found this moody little bridge to include in my composition as it helps in anchoring all elements of the picture together. 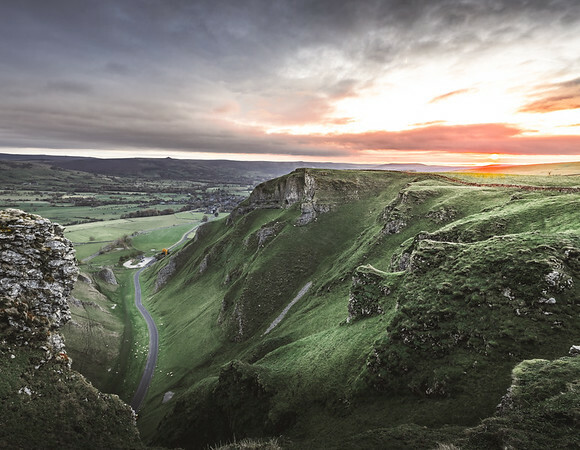 When we arrived at the bottom of Winnats pass a hint of sunlight had already begun to peek from behind the horizon. We had 2 options - either follow the proper trail to climb the cliff which takes about an hour and miss the sunrise completely or put our amateur climbing skills to test and climb straight up the face of the cliff you see on the right here. We chose the latter and boy did it pay off! A short trek from the National Trust Ilam Park takes you into these beautiful dense woods surrounding the river Manifold. Walking through the forest we came upon these stone steps that take you up a steep slope deeper into the woods. 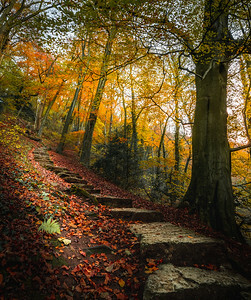 The entire ground was covered with red fall leaves and the steps stood out in contrast to create nice foreground interest and also provide a leading line to the brightly coloured autumn foliage in the background. Combined with the dappled light from the setting sun, the scene was surreal - almost magical! 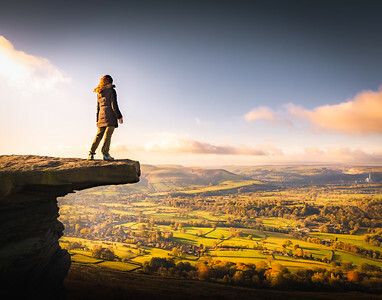 After getting a couple of sunrise shots down at the Ladybower Reservoir, we finally managed to find the trail and climb up to Bamford Edge. The Edge offers astounding panoramic views of the reservoir and the national park beyond. We found this outcrop which was literally hanging from the edge with views across the valley. @eyeseesurs was brave enough to fight the gale force winds and pose on the protruding rock. 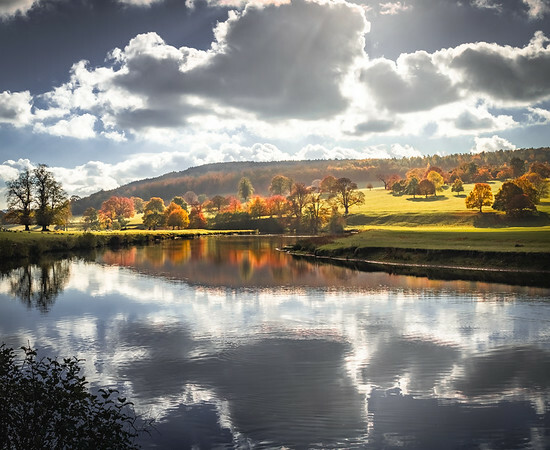 The Chatsworth house in Peak District is a wonderful place for some autumn photography. I did not shoot the buildings as that's not the kind of work which appeals to me, but the house grounds were simply fantastic. 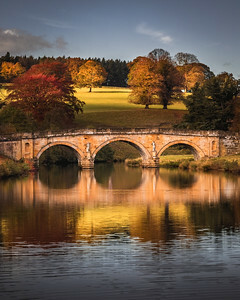 Acres of moorland with trees in all their autumn glory, a snaking river cutting through the grounds and this beautiful little bridge combined with some brilliant warm light from the evening sun - what more could you ask for? 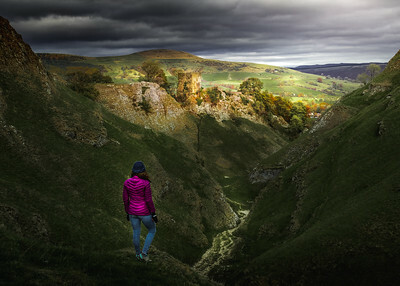 A casual walk in the Cave Dale valley on a dark and gloomy day turned into an amazing photo opportunity when the sun decided to finally break through a few gaps in the clouds casting a brilliant spotlight on Peveril Castle and Lose Hill in the background. The valley was still in shadows creating amazing contrast in the scene. Thanks @eyeseesurs for adding some scale and colour to the dark foreground. This image looks like an inkblot test to me because of the patterns in the trees and clouds and their reflection. Although this is a river, it was moving slow enough and the light was hitting at just the right angle to create some stunning reflections. The first shot after we made it to the top of Winnats Pass. The sun popped up just as I finished setting up my camera. Talk about "in the nick of time". The scene was almost surreal as the first light hit the pass and the landscape transformed right in front of our eyes. 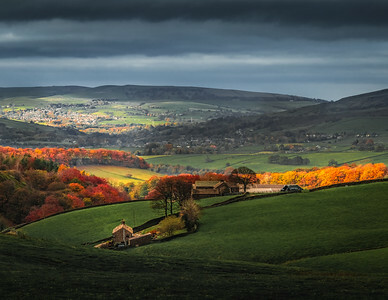 A few minutes later the light hit Hope Valley (in the background) and it was absolutely fantastic. I have posted a shot of that earlier. 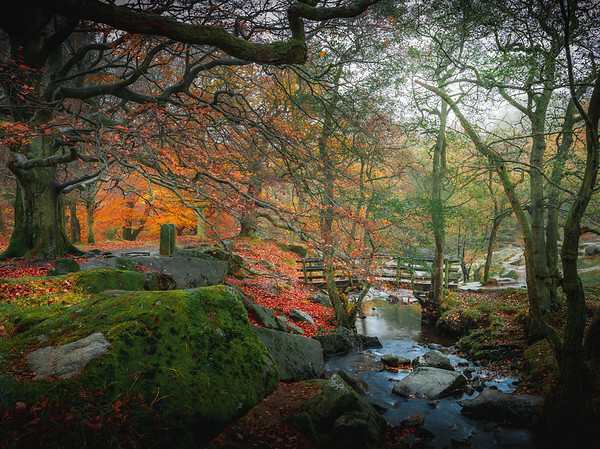 A misty moody autumn day in Padley Gorge. 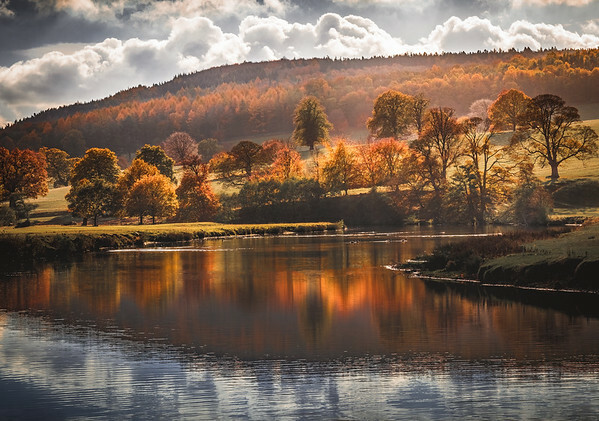 Probably the best location in Peak District to photograph autumn colours. We arrived during light rain but the weather improved quickly and we were left with this low mist over the river and no rain - perfect for some moody autumn photography. 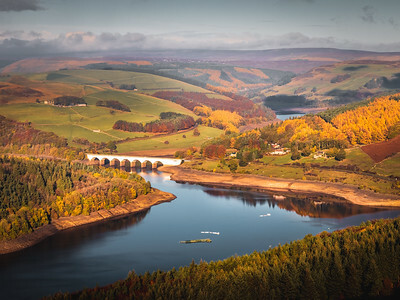 The plan was to climb up Bamford Edge to get a shot of Ladybower Reservoir at sunrise. We did arrive on time but couldn't find the start of the trail that goes up to the edge. Deciding not to waste all the good light from the rising sun, I got a couple of shots right from the road which goes along the reservoir before venturing off to find the trail. We did find it eventually and reached the top just after sunrise. The warm glow from the low evening sun lit up the autumn coloured trees from just the right angle to cast a beautiful reflection in a still patch of the river. 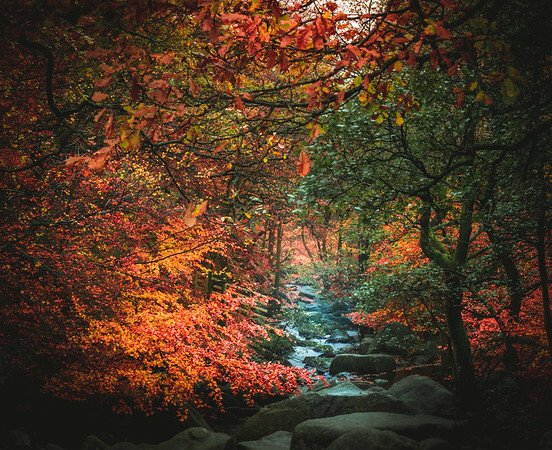 The low light also helped in bringing out and enhancing the orange and red hues of the foliage almost creating an illusion of luminescence. We were still searching for the trail to climb up to Bamford Edge when the first light hit the hills behind Ladybower Reservoir. Just as the sun rose, we were walking next to this field and the scene just transformed right in front of our eyes. The landscape went from cold blue to warm orange in a matter of minutes. Realising that there was no way we could climb to the edge in time to capture this glorious light, I decided to setup right there and get a couple of shots of this still dark and cold field contrasting with the warm and bright hill in the background. 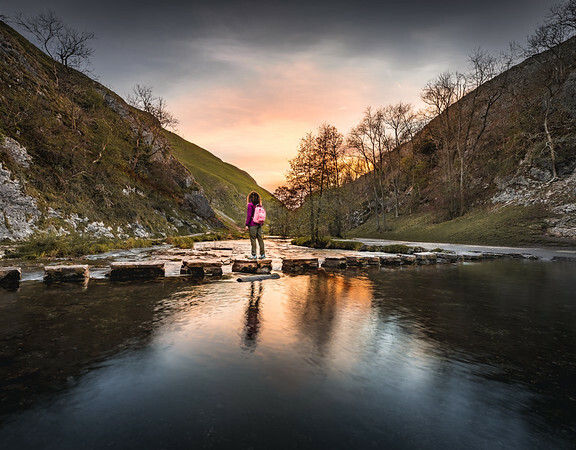 @eyeseesurs walking through Winnats Pass. We were here for a sunrise shoot from the top of the pass (pics to follow). This was shot after we descended from the cliff on the right and were walking back to the car. How we actually climbed this cliff is an interesting story for another time. Can you spot the expert climbers (sheep)? 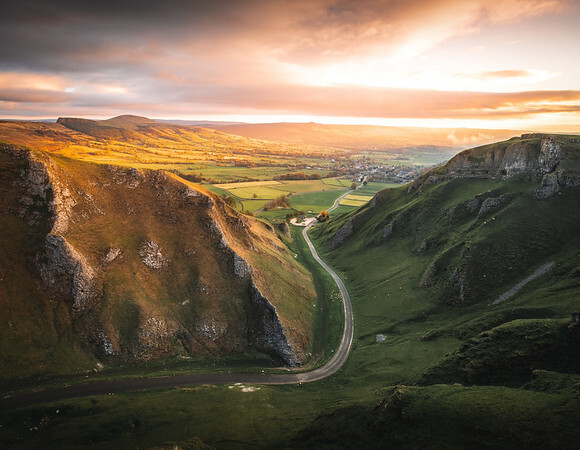 Winnats Pass is a hill pass and limestone gorge in the Peak District of Derbyshire, England. The road winds through a cleft, surrounded by towering limestone pinnacles.